Why is the men’s door always open? Maybe I am over reacting, but I feel like there is a trend that needs to be brought to an end. 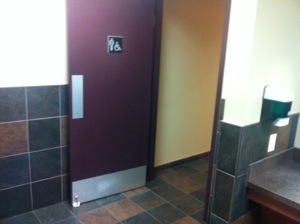 On my random journeys and travels I have noticed that businesses are commonly leaving the door to the men’s washroom wide open. If we started doing the same with the women’s washroom, I’m certain that someone would have already created an army to tackle this issue. My understanding is that women’s washrooms have a second door to provide each stall with additional privacy for users of these tolets. However, he men’s bathroom often doesn’t even have partitions between urinals to protect us guys from any potential prying eyes. Is there an assumption that men are are only people that would peer into the other genders toilets? Is there a fear that if they close the doors the men’s bathroom will result in inappropriate behaviour behind these closed doors? 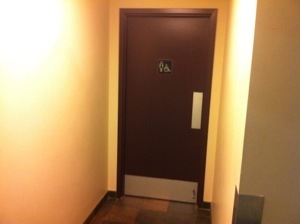 Can someone please provide some clarification for me about why I am not being allowed to have equal privacy as women when using the washroom? This entry was posted in Thoughts & Blogs and tagged 2013, Alberta, bathroom, business, Canada, Edmonton, etiquette, gender, men, privacy, Women. Bookmark the permalink. I want a couch and a phone in my bathroom! Its gross. fruit-flies that live on urinals can then enter the restaurant and infect food.